NEON Signs: "TRIUMPH", "AUSTIN HEALEY", "MINI COOPER S"
this little pile of neon signs we were lucky to find. Tested by us and neatly packed in the original carton, these beautiful little works of art will probably never be available again. Illuminated sign with red neon lettering on black acrylic background, set in transparent acrylic glass box. Mini Cooper S lettering. The box can be hung on the included chains. Measures about 80x30cm. UK mains plug for 220V, BMHT sticker on the light box. 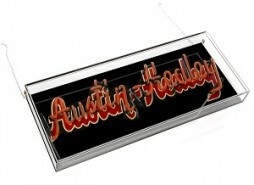 Illuminated sign with red neon lettering on black acrylic background, set in transparent acrylic glass box. Triumph lettering. The box can be hung on the included chains. Measures about 80x30cm. UK mains plug for 220V, BMHT sticker on the light box. 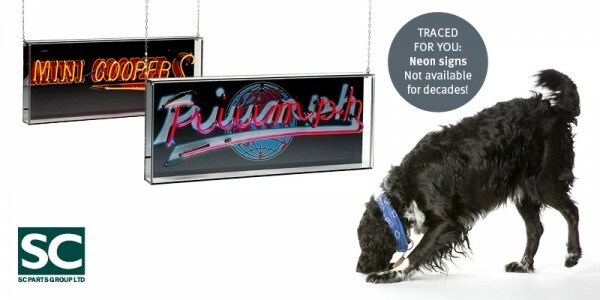 Illuminated sign with red neon lettering on black acrylic background, set in transparent acrylic glass box. Austin Healey lettering. The box can be hung on the included chains. Measures about 80x30cm. UK mains plug for 220V, BMHT sticker on the light box. Classic style and British manufacturing are both experiencing a boom in demand—driven by a desire among consumers for authentic, quality products. Britain is uniquely placed to benefit from this resurgence, given the number of heritage companies still producing at the top of their game. From the world-famous Barbour in South Shields in the north of England to John Lobb in London, many of these fine businesses remain in family ownership, protective of their traditions and justifiably proud of their products. A guide to van manufacturers (large and small) are dealt with in A-Z order, from Austin, Bedford, Bond and Commer to Reliant, Standard, Triumph and Trojan. In the twenty-year period following World War II, light commercial vehicles in Britain gradually changed from being working versions of passenger cars to vehicles which were specifically designed for the job. At the beginning was the Morris Eight van, which struggled to cope with a five hundredweight load, or to reach 50 mph. At the end came the Ford Transit which carried three times that load, drove like a car and cruised at 70mph.